libsquish (a popular DXT encoding library) internally uses a total ordering based method to find high-quality DXT endpoints. This method can also be applied to ETC1 encoding, using the equations in rg_etc1's optimizer's remarks to solve for optimal subblock colors given each possible selector distribution in the total ordering and the current best intensity index and subblock color. I don't actually compute the total ordering, I instead iterate over all selector distributions present in the total ordering because the actual per-pixel selector values don't matter to the solver. So basically, the new optimizer first tries the subblock's average color, then it computes and tries a series of "correction" factors (relative to the subblock's average color), which depend on the current intensity table index and the current best subblock color found so far (to account for clamping). A hash table is also used to prevent the optimizer from evaluating a trial solution more than once. Intel is doing some kind of amazing SIMD dark magic in there. 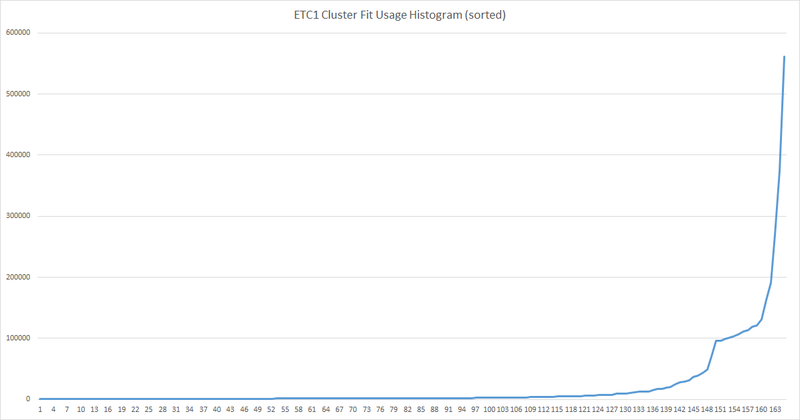 The ETC1 cluster fit method is around 10-27x faster than rg_etc1 (which uses my previous method, a hybrid of a 3D neighborhood search with iterative base color refinement) and etc2comp (effort 100) in ETC1 mode. RGB Avg. PSNR is usually within ~.1 dB of Intel. I'm so tempted to update rg_etc1 with this algorithm, if only I had the time. 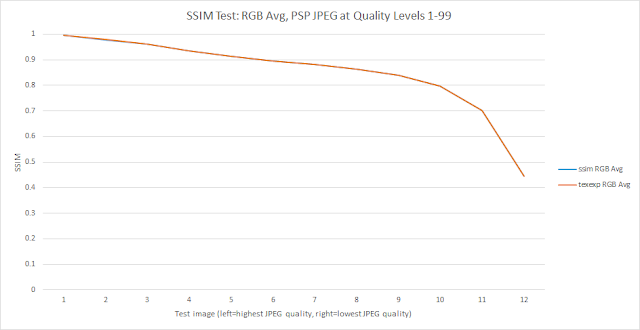 Update 10/1: Okay, I computed a histogram of the "winning" subblock average color correction factors applied over a few hundred test textures. I then selected the top 64 correction factors (out of 165), and don't bother trying the rest. Here's a graph showing the usage histogram of the selector distributions across all the test textures, sorted by frequency (the most successfully selector distributions are to the right). rg_etc1 tries refining the current best subblock color found so far as it scans "around" the ETC1 444 or 555 color 3D lattice surrounding the subblock's average color. This refinement approach takes as input the current set of 2-bit selectors, the current best intensity table index, and the current best subblock color (only to account for clamping). 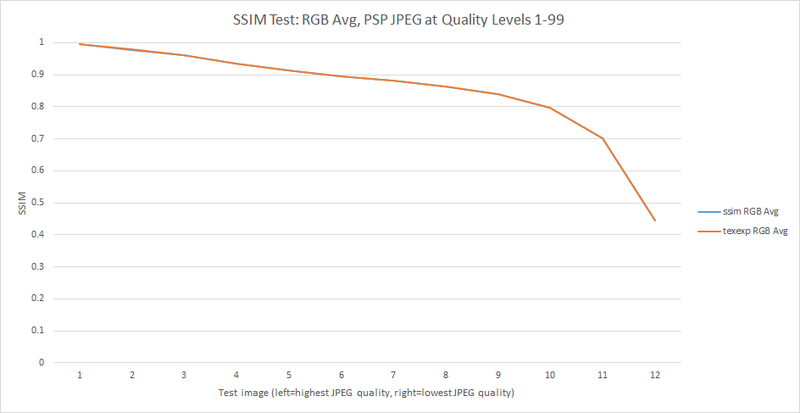 Given this information, you can compute a RGB "correction" factor which is subtracted from the subblock's average color to compute a potentially better (lower error) subblock color. // Now we have the input block, the avg. color of the input pixels, a set of trial selector indices, and the block color+intensity index. // So the optimal block color can be computed by taking the average block color and subtracting the current average of the intensity delta. // Unfortunately, optimal_block_color must then be quantized to 555 or 444 so it's not always possible to improve matters using this formula. // Also, the above formula is for unclamped intensity deltas. The actual implementation takes into account clamping. To implement cluster fit for ETC1, you can iterate over the total ordering of all the selectors for each of the 8 subblock pixels, much like squish does in DXT1. However, doing this is unnecessary, because all that ultimately matters in the refinement equation is the computed avg_inten_delta, which just depends on the selector distribution (and not what each pixel's selector actually is). Here's my current optimizer's compute() function. It first tries the subblock's average color (at coordinates m_br, m_bg, m_bb), to establish a baseline (minimally useful) solution, then it iterates over the precomputed (and sorted) selector distribution table and attempts applying (usually) a few dozen or so avg. 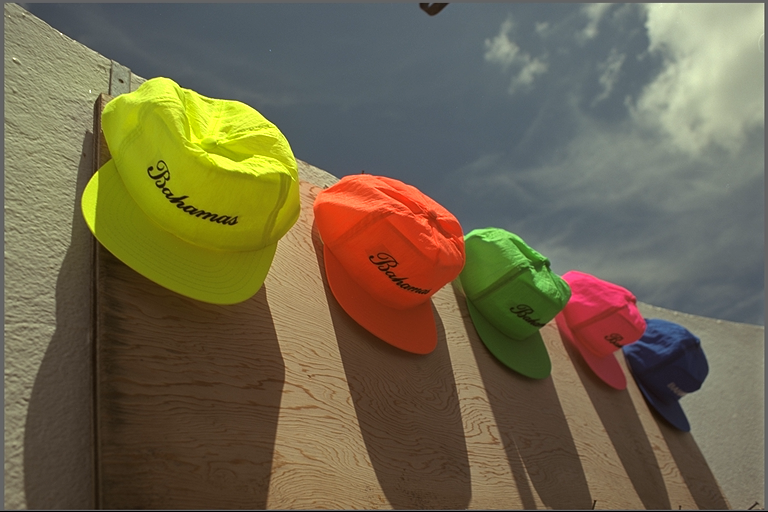 color "correction" factors from this table. The table is sorted, so the entries with the highest probability of applying the best correction appear first (as mentioned above). Note that evaluate_solution() uses a hash table to avoid trying the same solution more than once. The sorted table of total ordering selector distributions is at the bottom of this post. This is an example of an well-tuned ETC1 encoder (Intel's) holding its own vs. etc2comp in ETC2 mode. Want a little challenge: Try to figure how how Intel's encoder produced the best output. John Brooks, the lead on etc2comp, told me that BSI is working with that test image because it's a known low-quality encoding pattern for etc2comp. It wasn't in their test corpus, so the PSNR of 17 & 19 should improve with future etc2comp iterations. 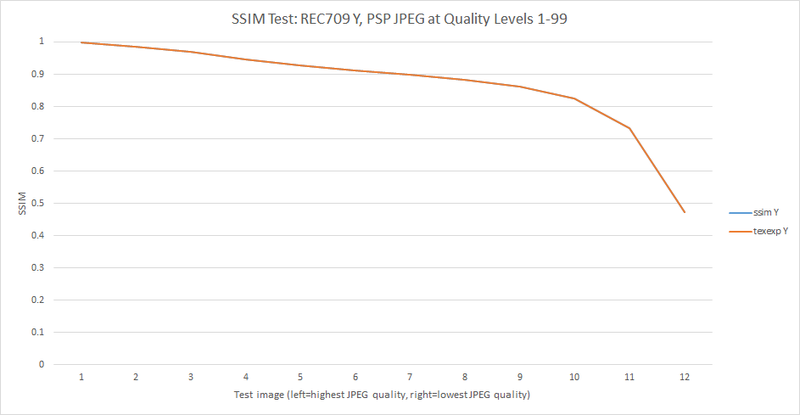 I've improved basislib's handling of this test vector, but the results now need a optimization pass. I've prototyped a version of squish's total ordering method in ETC1, by applying the equations in the remarks in rg_etc1.cpp's code. Amazingly, it competed against rg_etc1's current algorithm for quality on my first try of the new method, but it's slower. The code that computes this stuff is actually used by the DXT1 front-end to determine how the 8x8 "macroblocks" should be tiled. The per-channel stuff is useful for debugging, and for tuning the encoder's perceptual RGB weights (which is only used when the compressor is in perceptual mode). Per-channel stats are also useful when trying to get a rough idea what weights a closed source block encoder uses, too. "Candid Covariance-Free Incremental Principal Component Analysis"
With this approach you can compute a decent-enough PCA in a few lines of shader code. HW1 used this encoder to compress all of the GPU splatted terrain textures into a GPU texture cache. One of my coworkers, Colt McAnlis, designed and wrote the game's amazing terrain texture caching system. 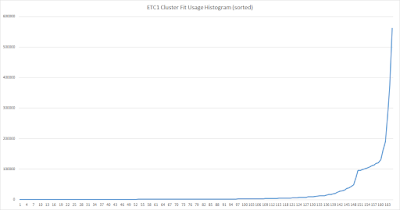 I'm using the same testing tool, dataset and methodology explained in my ETC1/2 benchmark. In this benchmark, I've added in my vanilla (non-RDO/CRN) DXT1 block encoder (really, its DXT1 endpoint optimizer class), which is derived from crunch's. In 2009 my DXT1 encoder was as good or better than all available DXT1 compressors that I tested it against, such as squish, ATI Compressonator, NVidia's original and old NVDXT libary, and D3DX's. Not sure how much change has occurred in DXT1 compression since that time. I can also throw in other DXT1 encoders if there's interest. John Brooks at Blue Shift brought up this idea earlier. I think it's a great idea! I love good old DXT1 (or "BC1" as some call it). Let's see how ETC2 in particular compares against my old favorite. Yes, I know PSNR (and RMSE, etc.) is not an ideal quality metric for image and video compression. Keep in mind there is a large diversity of data stored as textures in modern games and applications: Albedo maps, specular maps, gloss maps, normal maps, light maps, various engine-specific multichannel control maps, 2D sprites, transparency (alpha) maps, satellite photos, cubemaps, etc. And let's not even talk about how anisotropic filtering, shading, normal mapping, shadowing, etc. impacts perceived quality once these textures are mapped onto 3D meshes. RGB and Luma PSNR are simple and, in my experience writing and tuning crunch, reliable enough for practical usage. I'm not writing an image or video compressor, I'm writing a texture compressor.